used daily onstage and in studios around the world. 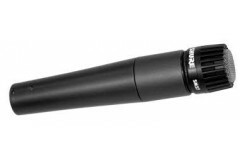 exceptional mic for musical instrument pickup and vocals. with its bright, clean sound and contoured frequency response, its ideal for live sound reinforcement and recording. in the studio, it is excellent for recording drums, guitar, and woodwinds.